This chutney is one of the best side dishes that goes good with Kara Kuzhambu/Puli Kuzhambu/Vatha kuzhambu. 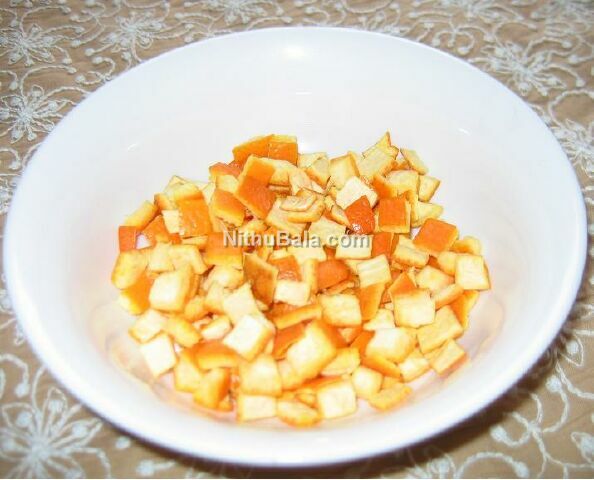 My MIL used to prepare it with Citron(Narthangai) peels but I tried it with orange peels. The taste is so good and personally, I felt it is bit more aromatic than citron peels. This chutney is sweet in taste. 2. Add water to jaggery and make it to syrup. Filter and Keep aside. 3. In a pan, add oil. Pop mustard, then add red chillies and then curry leaves. Fry well. 4. Now add cooked orange peels. 5. Add the jaggery syrup. 6. Keep the stove in medium heat. 7. Keep it as such till the syrup thickens. 8. Serve hot/cold with rice. A really interesting recipe it looks alittle like orange marmalade. Woww fantastic and truly tempting pachadi..
Wow, The pachadi looks wonderful.Besides the white rice, I am curious what else I can eat this with. new recipe to me!will try it for sure. Havent heard of this dish before..Looks tasty..
Oh.. thats a lovely dish.. totally new to me!!.. very innovative!.. 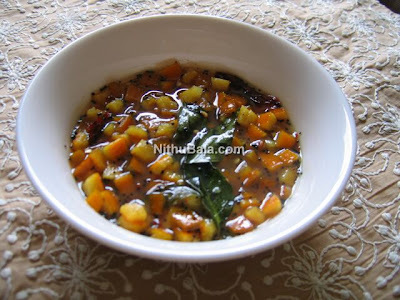 A really yummy chutney.My aunt used to make this. nice way to use up the peels instead of just tossing it away.. love it.. I love the flavor of this pachdi,love to hav it with curd rice! Your orange peel chutney looks and sounds amazing! I love orange marmalade, I believe I will love this chutney too, can't wait to give it a try. Thank you for reminding about the deadline of this event, I'm afraid I don't have enough time to cook anything tomorrow. this is new to me, sound interesting! Wow, that was very innovative, never made with orange peel. Loved the texture,flavour and the color, got to give a try soon. Thats an innovative dish, peels are loaded with vitamins, looks wonderful. wow! looks tempting! I think it should go well a simple bread toast and even dosas! Lovely and very healthy way of eating the orange peel, instead of adding them just in cakes! Lovely post! Wow, very new and interesting recipe, Looks yummy too. looks yummy and very new to me..